Whether you’re just starting to build your classroom library or want to add to it, the Booksource Literature Cart will keep your balanced, leveled collections organized and mobile. This library on wheels is compact and portable, yet carries up to 300 titles. So while it’s easy to move, it’s also large enough to house a wide spectrum of books. The Booksource Literature Cart can be purchased alone or with books. 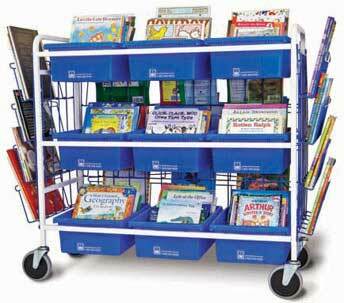 The literature cart is available for grades K-6. The cart includes one copy each of 300 titles, featuring fiction and nonfiction books balanced by reading level, topics and genres. Customization is available, and free book labels are included.